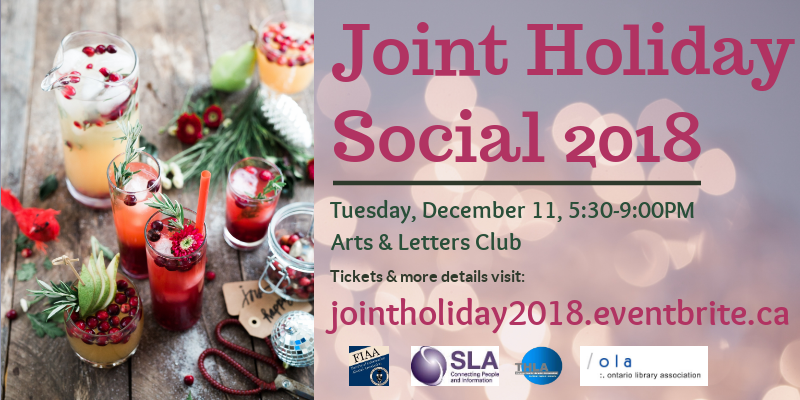 On behalf of the THLA, we invite you to attend this year’s Joint Holiday Social on Tuesday, December 11th at the Arts & Letters Club. All details and tickets available here. Join your colleagues from special libraries and information centres across Toronto and the GTA to celebrate the holiday season! The evening will feature a professional headshot photographer, words from participating associations, awards, and door prize draws, not to mention food, drinks, and opportunities to connect with others in the Toronto special libraries community. We are very excited to offer a headshot service with a professional photographer during the Joint Holiday Social. You can learn what is offered in the headshot service and purchase a ticket here. This year’s Joint Holiday Social is brought to you by the FIAA (Faculty of Information Alumni Association), SLA Toronto, THLA (Toronto Health Libraries Association), and OLA Special Libraries. Questions and more information, contact Mary Gu, SLA Toronto’s Interim Programming Director.